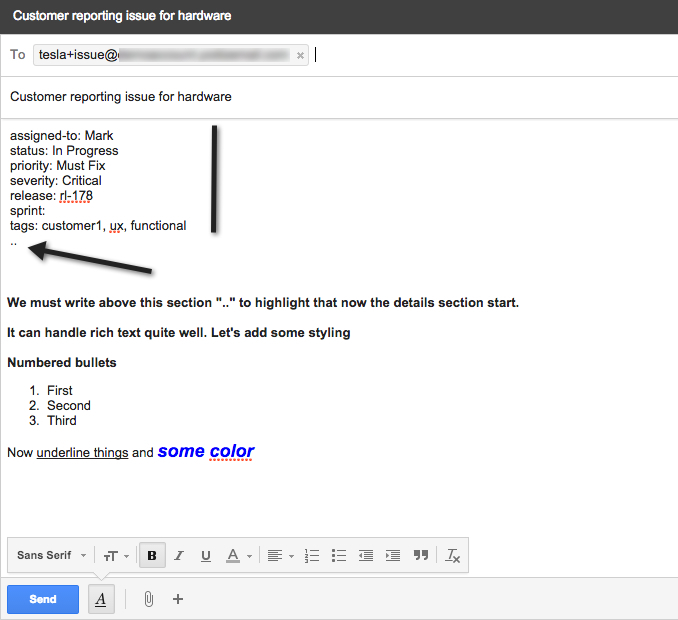 Yodiz offers possibility to create new issues and user stories via email. Please select from top navigation under "More" option "Interact Via Email" to get more details. When you access this page first time you will get an empty screen, prompting you to select "Subdomain" for your organization. This subdomain has to be unique. Project keys are unique values to identify each project. once you define the project key you will get unique email address to create issues and user stories. There are 2 modes to create items. Attachment in email will be added to Issue attachment. A new issue in Project Team Tesla will be created with these details. In Advanced mode you can use following notations to assign responsible, sprint, release, tags and few other things. .. These two dots are very important to write to tell system that attributes area is finished. Everything written after ".." will be added to Details section. Only users who are part of yodiz project will be able to create items via email. If somebody sends email to project unique email address and that person email doesn't exist in Yodiz then an auto-reply email message will be returned to user that they must be part of Yodiz project to create items. It is not possible to edit existing items via email at the moment, but we are planning to introduce this feature in near future. So do let us know your feedback.